Here are the differences that I have noticed so far. Hasbro has different switch box setup and is easier to dissasemble than the MR version. Clash sensor is seperate and in the blade base. Hasbro has different switch box setup and is easier to dissasemble than the MR version. All you need to do is take apart the switch box to get the guts to slide right out. The inner casing is glued together but pops apart pretty easily. Clash sensor is seperate and in the blade base. Interesting, seems Hasbro have done us all a favor Will you be attempting any conversions? These are ones I have taken apart so far. I am verifying the old kits work or designing new ones. I have done an Anakin ROTS with the old kit and it works like a charm. Disassembly is exactly the same as the MR.
west of the minster ca. Last edited by wallflores1469@aol.com; 02-10-2009 at 08:51 PM. 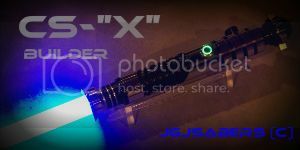 I see the new Hasbro Obi Wan conversion kit is in the shop... Will that work on an MR saber? I'd have to say, no, since Tim mentions in the first post that the kit will be different from the MR.